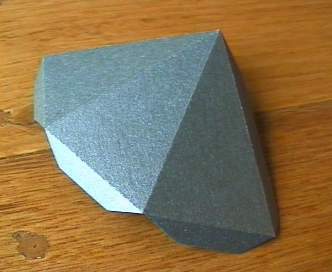 One of the four Kepler-Poinsot solids. It consists of twelve intersecting pentagrams. 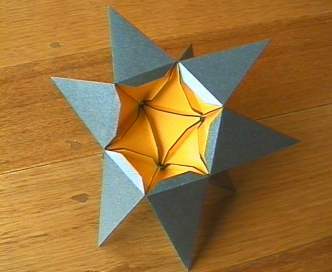 It is the final stellation of the dodecahedron, and also a faceting of the dodecahedron. Twenty copies of this net are required to complete the model. I use a triangle at the base of each spike to add rigidity. You can print these out by printing the net of an icosahedron, setting "Nets>Maximum Faces per Net" to "1" to get individual triangles (you need tabs all around). 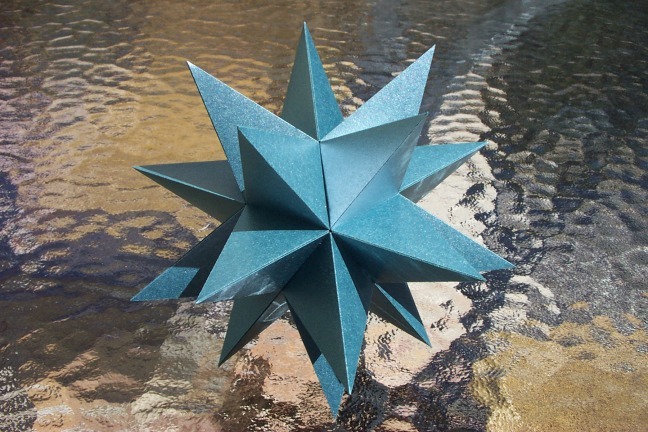 You can see an icosahedron forming inside the model as you put it together. 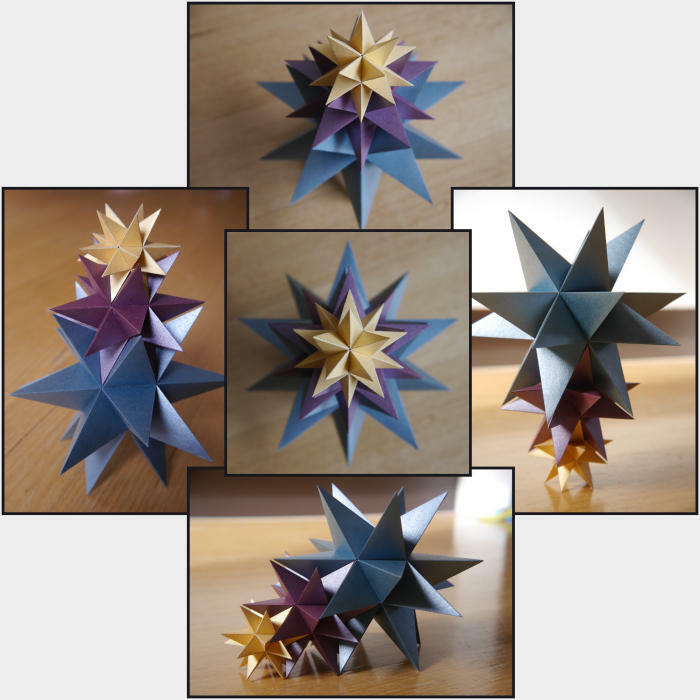 To get the scale right for the icosahedron, use "Selection>Mouse Selection Mode>Measurement Mode" and click on two of the inner points on the great stellated dodecahedron that will form an edge of the internal icosahedron. The length of this edge will be shown on the status bar at the bottom, or you can get it using "Scale>Measured Distance". Use this length as the edge length of the icosahedron using "Scale>Base Polyhedron Edge Length". This tiny model was made without any internal support. 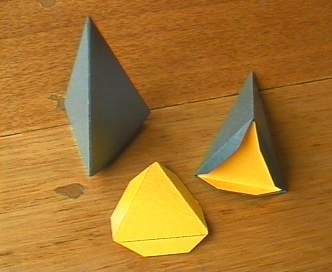 Since the spikes have only three sides, they tend to be quite rigid anyway. 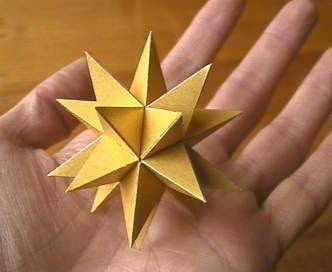 A stack of these models can be made, each scaled by the golden ratio with respect to the next one in the stack. The models fit together perfectly, and various points, lines, and planes align with each other as if by magic. Here is the same stack viewed from above. 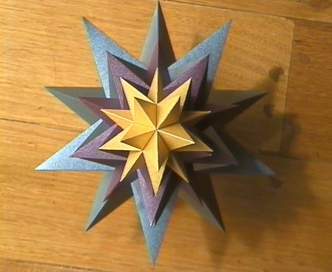 Here is a compound of the great stellated dodecahedron with its dual.